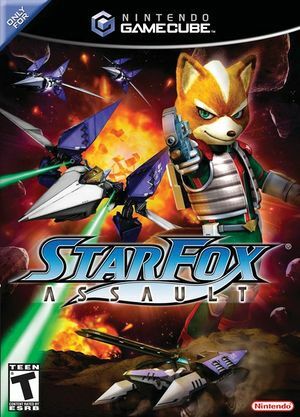 Team Star Fox is back for more intense combat in Star Fox: Assault as they engage a new threat by air and by land. A few years after disaster was barely averted on Dinosaur Planet, Lylat Central Command gets wind of a new threat spreading throughout the solar system. The Star Fox team--composed of classic team members Fox McCloud, Slippy Toad, Peppy Hare, and Falco Lombardi, along with some new faces--is sent in to engage this new enemy. Now, as part of the Star Fox team, you can participate in solo or co-op missions or plug in with up to three other players. In the fifth mission, when you reach the infected prototype (You see Pigma's base, and then fly up the wall) the game can crash. In order to avoid this, you MUST NOT die after this point in the stage. On Silver/Gold difficulties, firing too much during the Infected prototypes first attack can also crash the game. Refer issue 8935. To play properly in 16:9 and eliminate Object pop-in at the edges of the screen during gameplay, before booting the game, use one of the following Gecko codes.. The graph below charts the compatibility with Star Fox: Assault since Dolphin's 2.0 release, listing revisions only where a compatibility change occurred. 3.0-179 Windows 7 Intel Core i3-370M @ 2.4GHz AMD Radeon HD 6370M Fully playable: No slowdowns, no known glitches. This page was last edited on 14 April 2018, at 22:04.